Why not have time zones in India? Coordination adjustments will involve minor inconveniences, if at all. There will be ample economic benefits. It's an idea rejected by the central government many times over - the latest in December 2018. India must remain united by a single time, the government reasoned, because coordination between zones for transport, railways, bank work, security agencies, and so on would be difficult. Never mind that so many vaster countries easily manage time differences and in the process gain in productivity. Russia has as many as 11 time zones, the US six, and Canada seven. These countries add even more to their productivity by adjusting for daylight saving time (DST) during summers. "When a country functions on a standard time based on its mean longitude, the people who live in the west (of the mean longitude) are always in an advantageous position. They get to utilise more daylight hours than those in the east. This is simply because though the east gets daylight earlier, they have to wait for the west to start their day. In other words, the people in the west get to start their day either on time or even earlier depending where in the west the area is situated. And in the process, while following the standard time of the country, they get to utilise more daylight for productivity. This is one major reason why in any time zone people living in the west are more productive and prosperous than the people who live in the east of that time zone." Given the wisdom of the government, we persist with a country in which the local time in Mumbai, to the west, is nearly two hours behind the local time in Kohima, far to the east of the country. And with the curious case of towns in the Chicken's Neck area, where Indian standard time (IST) is followed: west of them lies Nepal, where the time is 15 minutes ahead, and east of them lies Bhutan, where the time is 30 minutes ahead. The digital, connected world has learnt to live with programmers, virtual assistants, business back-end managers and other professionals in India handling work in Europe, US, and Australia. In fact, many foreign banks have their office work and documentation done at offices in Bangalore, Pune, and Hyderabad. In fact, a country that has prospered so much through outsourcing in recent decades, should have been quicker to open to the idea of at least two time zones. The government's stand on coordination rings hollow. After all, our international trade, aviation, shipping, banking has functioned smoothly despite the different times in the countries we deal with. There might be minor inconveniences, but it would smooth out over no more than a year. In fact, to make a political statement to be remembered by, Narendra Modi could have time-zoned India instead of imposing demonetisation. It would have been big enough to be memorable, like Indira Gandhi's bank nationalisation and privy purse decisions. It would have caused far less inconvenience. It would have improved productivity in the northeastern states, with which Modi has been cultivating an emotional connection. 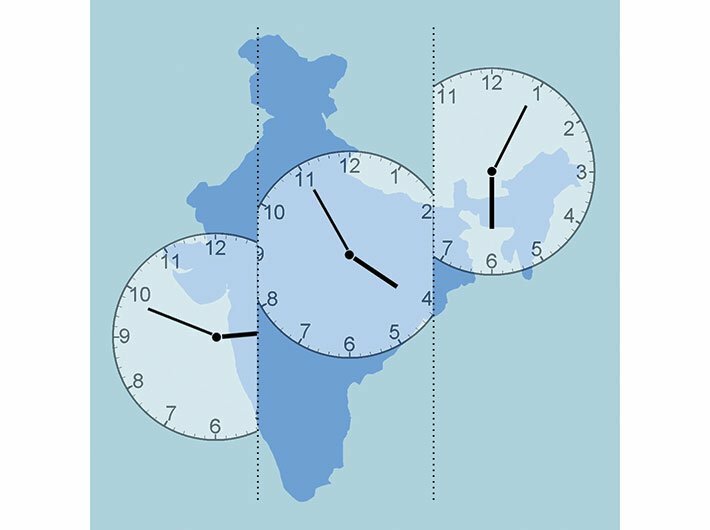 But the bogey of security -- the UPA government too rejected the time-zone proposal from some MPs -- is unlikely to be seen as a fiction by our ossified bureaucracy. There is really no reason why India cannot have at least two time zones. But since an obdurate government insists it cannot happen, to improve productivity governments of states in the east will have to adjust work hours. That would be a true sign of effective federalism.